We get it. Shakespeare is public domain. Anybody looking to make a cheap buck can throw a random Shakespeare quote (or a hundred) onto a Shakespeare t-shirt and try to make a buck off of it. That’s not what we’re trying to do here. If you’ve landed on Shakespeare Geek you’re probably a true fan of William Shakespeare, and believe like we do that Shakespeare makes life better. We’ve been doing this for over thirteen years now, not because we’re in it for the money, but because we want to see more Shakespeare in the world. I know this site isn’t the prettiest thing in the world, but I’m working on it, I promise! It’s a constant juggling act to churn out new designs and to adequately keep all the marketing material (like this page) up to date. Thank you for your support of the site, and the mission. There are, as of this writing, almost 100 original Shakespeare Geek designs available on Amazon! But, see, here’s the thing – I don’t control anything about that page. Amazon decides for themselves what’s featured, and really, when anything shows up at all. That’s made it hard to really drive any traffic. So what I’ve got for you here are my Best Sellers. I hope you like them! If you click through to Amazon at any time you’ll be able to browse around and see everything anyway. I love that this one sells well. It’s a simple enough idea. Quite frankly it came up in a conversation somewhere (reddit, probably) and it’s not even my original, but I asked the author for permission to run with it. Buy here! This one has been a huge seller, but Straight Outta Birnam Wood gives it a run for the money. Straight Outta Elsinore didn’t take off quite so much. Go figure. Click here to purchase. This shirt is one of the first that I actually tried to design, rather than just dealing in pure text. I found an app that offered a variety of circular center images and then would put whatever you wanted around the edges. Once I realized that all the character pairings balanced out just right I knew I had something. My favorite part is how we decided to put Bottom on top, which treats him like the star of the show while also being a bit of wordplay, but Puck ends up upside down where he’s probably quite happy. Available in a variety of colors. I’m so happy to see this one catching on. I spent literally forever on the software to do this effect. 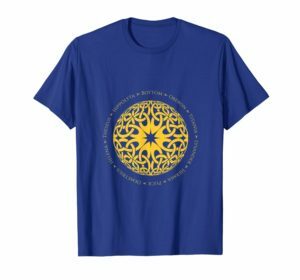 It literally tosses random quotes randomly around the shirt (in random sizes, colors and rotations) and then plays around with them machine learning style until it finds a combination that fits all the criteria – no overlap, nicely balanced without gaps, etc.. This hasn’t been manually altered at all. The only downside is that the thumbnail doesn’t do it justice! If it sounds intriguing please make sure to click through so you can see the whole thing! See this and my other latest designs here! I made this one for Valentine’s Day, but it’s nice to see it getting sales throughout the year. This is another example of trying to do something a bit more algorithmically and use my computer science side for something interesting. Here I actually dissected the dialog for both Romeo and Juliet and made a nice word cloud out of it. Once I saw that love wins but death is right there lurking in the shadows, I knew we had a winner. 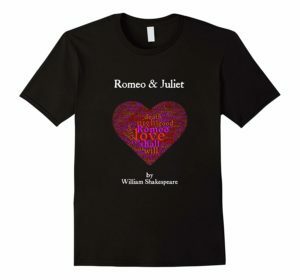 Shop this and other Romeo and Juliet designs now! I can’t call this a Friends shirt over on Amazon but we all know that’s what it is :). I made a whole series of them – Hamlet, Romeo, Juliet – basically everybody with short enough names – but Macbeth ended up selling the most. The One Where They Click Here To Buy. This was one of my first text only, quote only designs. I thought maybe the motivation market might like it. Wear it to the gym, that kind of thing. I have no idea where people are wearing it but I do know people are buying it! Buy it here. I’ve told this story so many times you must be bored with it by now. This is the original. I put it up on a whole different site way back in 2008. I have a picture of myself wearing it (ok, a different color) in front of my first visit to the Folger Shakespeare Library. It became such a good seller for me that it was immediately copied all over Amazon. If you like it, please remember to get only the original, and support Shakespeare Geek! Own the original! I wish you could see the text better in this one. This one hit me at lunch one day when I was walking around the block and I saw a woman coming the other way with a shirt that said, “Do you bite your thumb at us, sir?” I thought, I’ll make one with the next line and then if we ever bump into each other again we’ll have something to talk about! Buy now. I think this one doesn’t do as well as the other “Straight Outta” designs because nobody really got out of Birnam Wood, they took the whole wood with them up the hill! Click here to purchase. I’m pleasantly surprised by a resurgence in sales for this simple design, one of my older ones. In fact, the Capulet version didn’t really sell and Amazon de-listed it! I noticed recently that it is Featured by Amazon, so I’m not sure what came first – did they feature it because sales are up, or are sales up because it’s featured? Either way, if you really want a Capulet shirt to exist let me know and I’ll bring it back from the dead! Buy it now! If you ever see something that you wish was just slightly different – a different color, a different size, maybe something in long sleeves or a hoodie, please just contact me. I have several different sources for merchandise, not just Amazon, and can make stuff happen in stickers, mugs, tote bags, all that good stuff. I just can’t organize doing 100 designs in all possible combinations so I have to go with what the people want!